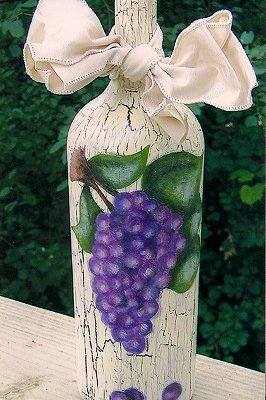 Bring the feel of the "old country" into your home with this Tuscan inspired wine bottle craft from Amanda Formaro. Recycle an empty wine bottle and turn it into a beautiful decoration with these free tole painting patterns. Love wine bottle crafts? So do we! For more projects like this one, check out our collection of 10 Things to Do With Old Wine Bottles + 16 New Craft Tutorials. Wash wine bottle, removing all label residue. Dry, then rinse with with white vinegar or rubbing alcohol. Allow to dry. Base coat the entire surface of the bottle with Black Cherry. Let this first coat dry completely before continuing. Allow at least an hour. Apply crackle medium over the Black Cherry according tot he directions on the bottle. Follow bottle directions for drying time. Apply a coat of Antique White over the crackle medium and allow to dry overnight. Transfer the pattern onto the surface of the bottle using a stylus and black carbon transfer paper. Paint the grapes with Grape and the leaves with Leaf Green. Paint the branch with Autumn Brown and shade with Black. Shade leaves with Forest Green, highlight leaves with Santa's Flesh on a dry scruffy brush. Shade the grapes with a "c-stroke" motion with Vintage Wine. 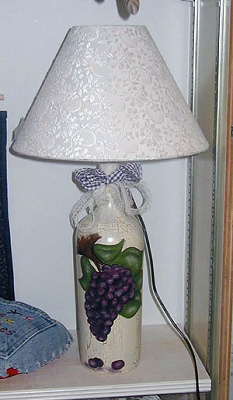 Highlight grapes with "c-stroke" motion in opposite direction with Lilac. use a scruffy brush to add touches of Santa's Flesh to highlight the grapes and use Vintage Wine mixed with a touch of black (just enough the darken it) to shade in between grapes. You can darken a grape here and there to give the bunch some depth. Highlight and shade wherever needed. Don't forget the grapes on the ground! Shade underneath the grapes with Black and the darkened Vintage Wine. Sign your work with a Micron craft pen! Spray completed project with 2-3 coats of acrylic sealer spray according to directions on can. This is absolutely beautiful! I'd like to try it.